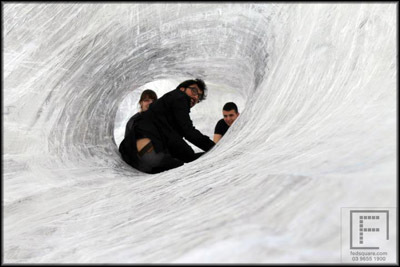 Numen / For Use are an art and design collective who create organic, web-like structures from adhesive tape. Their temporary installations are large and stable enough for several adults to crawl through, and the effect is not unlike being trapped in a giant spider’s web. After climbing up a step ladder, you find yourself suspended in a series of glistening caverns, the frosted plastic obscuring your view of the outside world. Their latest project, Tape Melbourne, took eight days to complete, with three artists and fifteen volunteers working nine hours every day. 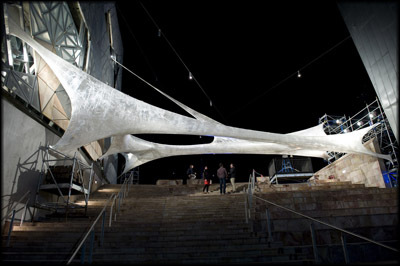 The exhibit used thirty kilometers of tape to build, with more tape to repair and fix the structure on a nightly basis. The Numen / For Use website contains more examples of their work, including images and videos of the construction process. You can explore their newest installation at Federation Square, Melbourne, Australia for a few more days; from now through September 24th, 2011.